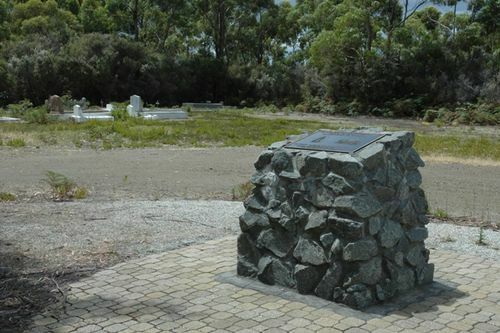 A monument erected at the site of the former Our Lady Queen of Peace Church commemorates the February 1967 bushfires, an event which became known as the Black Tuesday bushfires. They were the most deadly bushfires that Tasmania has ever experienced, leaving 62 people dead, 900 injured and over seven thousand homeless. 125 separate fire fronts burnt through some 2,642.7 square kilometres (653,025.4 acres) of land in Southern Tasmania within the space of five hours. Fires raged from near Hamilton, Tasmania and Bothwell, Tasmania to the D`Entrecasteaux Channel as well as Snug. There was extensive damage to agricultural property near the channel, the Derwent Valley and the Huon Valley. Fires also destroyed forest, public infrastructure and properties around Mount Wellington and many small towns along the Derwent estuary and east of Hobart. This memorial plaque was blessed by Father Chris Hope on February 7th 2007.